This chromolithograph is taken from plate 16 of William Simpson's 'India: Ancient and Modern'. 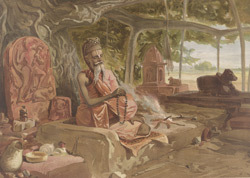 Holy men seated under trees, often a banyan tree as depicted in the painting, were a regular sight in India. The word fakir is derived from Arabic and means someone poor in the eyes of God. Used traditionally to describe itinerant Muslim mendicants, the word began to be applied imprecisely to Hindu holy men and ascetics who performed voluntary penances and went on pilgrimages. Simpson wrote of this portrait: "Many were dirty ascetics, but this was a clean, handsome old man, with a gentle countenance and the most courteous manners. His name was Gopal Dass, and he was a disciple of Seeta. His utensils for his simple wants: the gourd for water, a brass dish for food, his pipe with a bit of cloth at the end of it, tongs to lift the embers to light it with, and a conch shell he sounds when he enters the temple." Behind him, smeared in red colour, is a sculpture of Hanuman, the monkey god.